Lots of work have to be done in terms of materials or types of engines, but it will progress step by step. In the following table you can appreciate the possibilities of the script at this moment. 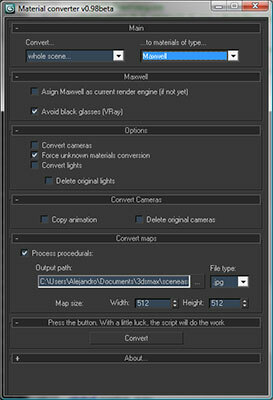 Previous How to bookmark camera angle & create a camera from bookmark in Maya? I am having trouble getting the conversion to Maxwell working. I have exported scene from Revit to Max via FXB and I am trying to render the model with Maxwell.